Time for a new lesson! And a "catch-up break" 🙂 With every class, we do a two weeks break for those who got somewhat behind to catch up and for those who are on schedule to give a dog a little break from plank running. I'll be answering your questions till Tuesday 4th October night and then again after 14 days, from 19th October morning again. Please don't post your videos during this time, I won't be reviewing old videos as things can change in 2 weeks. If you're behind, make sure to complete lesson 1 before you start with lesson 2 and that you complete lesson 2 before starting with lesson 3 - you can't jump steps, there is a reason I'm giving you this assignments in the order that I do! 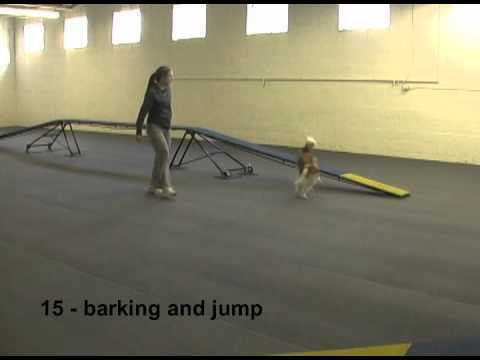 1. switch to a static toy, position it at the bar of a jump with a bar on the ground. The jump should be straight forward after the plank, about 7m away. The goal is the dog starts to look for a jump, knowing the toy is there. Occasionally, still throw a toy in advance, but mostly, have it there. When the dog already knows where it is, put a jump bar very low and a toy behind it (close after it, but far enough that the dog can land normally). Keep it there long enough that the dog is expecting it there. When you see the dog is pulling well towards the jump, knowing the toy is there, stop leaving the toy there and throw it after you click the contact, so that the dog gets it after the jump. 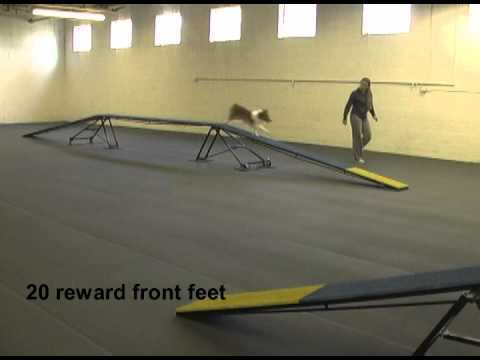 The goal is to switch from a static toy that is there as a target for the dog to focus him forward to a jump as a target to focus the dog forward and a toy as a reward we throw AFTER we see the contact is good. You need to be pretty quick as you don't want the dog to wait for the toy - so quick that I sometimes throw it before I realize the contact was actually not THAT good - but it gets easier 🙂 I guess this step will finally make everybody worried about rewarding leaps happy as now, you can withhold the toy for unsuccessful tries. HOWEVER, make sure the dog successful rate is high for this step as otherwise, you can loose the speed and get the dog checking back with you if you're throwing a toy or not. The same can be dangerous if you're late throwing a toy. This is usually an easy step for BCs who will run full speed in anticipation of the toy, but can be a very hard one for some other dogs. For Le, that was the hardest step. She was running beautifully if the ball was still rolling when she saw it, but if I threw it that early that it was already static when she saw it (or when I positioned it there), then she didn't extend well enough. What finally worked was going few steps back with height, exciting her a lot with a toy, throwing it at the jump and sending her quickly to the dog-walk. That made her striding good enough to continue long enough to have her look for the jump and then I quickly switched to a toy, thrown after the contact is done, over the jump. That temporary caused some checking back with me, so I needed to go back to a stationary toy again, but then she finally got the idea to keep running full speed towards the jump/tunnel and trust the toy will appear then 🙂 and that again gave me the beautiful striding I had before trying to get rid of a toy, thrown in advance. If the transition to a stationary toy is too hard, another way to try to avoid that phase is to pretend you are throwing a toy in advance, but then only throw it after. 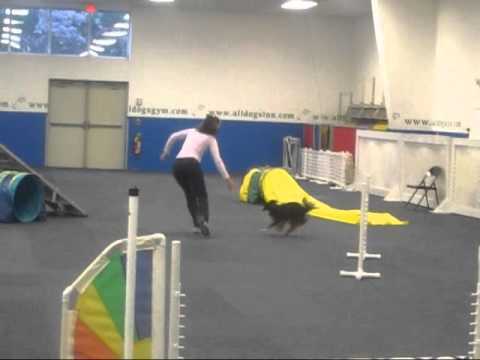 OR, using a tunnel as a way to focus the dog forward and throw it after the tunnel - works great with tunnel crazy dogs, didn't work with Le. Try and report back if you have problems. 2. keep adding height. If you have an option, it's also time to try the real thing. If you don't ahve a low DW you can use a normal dog-walk with additional plank at the end. 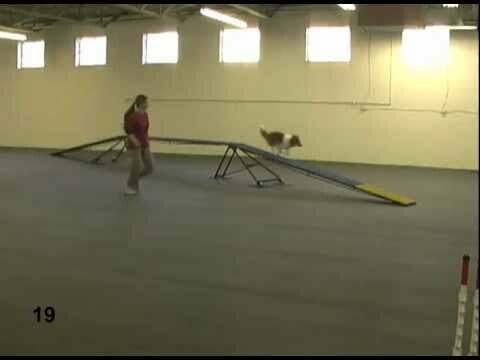 Start with down ramp only and then slowly put the dog further&further back until you run the whole dog-walk. When trying this or any other, new variable, don't vary other variables - make it as easy for the dog to succeed as possible. You can also lower a criteria somewhat. Normally, your criteria about hits by now should already be to be deeply in the contact - but temporary, you can click for good tries on a limit too, IF hind feet are well separated and the dog is not leaping. 3. new trick: have a dog back up on something very low and preferably soft first (folded blanket, low pillow) - then slowly add height, so that they need to pick up their hind legs higher&higher. At the same time, you can teach a "pee trick": click for lifting the leg, searching for an object, before they touch it. Make sure to try to get leg lifts on both sides - they usually prefer to go up with the same leg, so try to sometimes position them somewhat diagonally in front of an object so that their preferred leg is too far from it to start with that one. Also try climbing stairs backwards and cavaletti backwards. Here we are with todays training session. Day 2 on the new height. Hm, yes, still the same problem, doing one stride less as she would need to when coming with speed… I think I would mostly only do partial DW on this height to practice nice hits as those are really nice now, then raise it again, start doing whole DW, but only add speedy approaches with even more height, when she is less tempted to skip one stride. Oy, he just isn’t understand the striding at all, no good dw’s all weekend… These are from the trial this weekend, nice speed, not so good contact. Haven’t heard from me for a while because things have gone really badly. Have tried to build back up —the leaping is still occurring--right now we are back to a full low dog walk--but that fell apart--so am now backchaining from the middle section here is the most recent video of the last 2 days…and we get about 6 hits in yellow at the end. This is at least our 3rd time starting from the beginning (carpet, low board) and rebuilding. I’m sorry, but this again won’t work. You really need to go back to flat running, forget about the hits and find a way to focus her ahead and run full speed forward. Did you manage to teach her to chase a ball for a treat? The first part of this video shows his first DW, not super fast, but good, then a missed a-frame (even though it says “good” at first -- poor editing on my part!). I didn’t cue the blind before it very well, so he went wide there and then I just ran way ahead. Maybe too far? Is that unreasonable to leave him like that, he does like to chase me and I can run pretty well. The next DW he missed it, but the approach was not great. You can’t really see it but it wasn’t a good approach. Then the next one is a much better approach and he nailed it nicely. Then a nice a-frame. Then, my proudest moment is after a teeter melt down he was SO happy to do his DW!!!! Sure shows how happy he is doing his DW!! A great way to recover from his teeter trouble there!!! Just shows what this work can do for a worried little dog! 😀 Last year I might have had to pull him from some runs, but this year he recovered and continued to show me some really good work!!! So happy with how things are going with him!!! It was a tough trial, he knocked a bar one time, but managed to recover from that even. 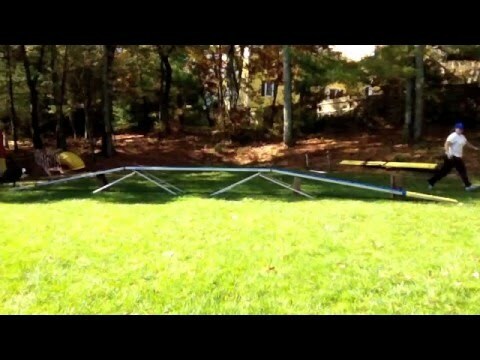 Knocked bars are almost as bad, maybe worse than the teeter? He rarely ever knocks bars because it scares him so. Oh, yes, he sure switches back to the happy mode when he sees his DW, that was just too cute! Not sure why he missed that A-frame, I think your handling was o.k. and he can normally hit it that way… Maybe you were turning into him and slowing down too much? Chasing you is good, but try to adjust your speed so that you’re not so far ahead that you need to slow down -- and don’t stare at him! Sorry to hear about that bar, but he sure seems to recover well after scary things like this now! I’ve heard you say that before about the staring. I do that all the time in training, but you think we shouldn’t do it at trials? For now, or ever? Would be cool to see Roscoe on TV, but yeah, I don’t like to do TV or other shows either, not so much fun for the dogs as practising at home! OK. The trouble is with the going into nothing work, it seemed it was helping him if I was ahead, so I have been watching pretty much a lot, LOL. Although, that last session last week he was driving ahead of me. He isn’t, yet, driving ahead of me in trials as his speed in trials is definitely not what it is in training. I’ll try to stay back in trials some and/or drive *with* him more. He likes to chase me, but I also think he wants me with him, too, so I’ll work on that at trials. This was his second missed a-frame at a trial recently. Last one was the trial before Nationals and I was pretty much with him. Should I worry about it or not, and see if it just gets better as he gets more confidence? Certainly at this trial he was having some issues, but remarkably there were moments he was faster than he has been at trials. So, he is working things out right now, for sure. It does seem he is in a bit of an “experimental” stage and with Spur these things can take a while. He needs a lot of time with things to get sure/confident. Yeah, that’s right, you have to stare some when in front… I guess that’s why I don’t train being in front enough! 🙂 So his A-frames are good in trainings, but he missed two at trials recently? Despite approaches were good? that is strange, but yes, I would leave it for now and see what happens in next trails. Meantime, try to experiment in trainings some what gives you the best hits so that you can plan your handling in trials that way. Having an experimental stage,…. I think. Did another session after a break and it wasn’t good. Probably about 40%. Geez. So, tomorrow I will set up both tunnels about 7 meters. That’s his good set up that usually gives us 100%. I’ll try to get a bunch of good reps in and then move the tunnels away much slower, like just a foot each session and see how it goes? He just isn’t getting it when they are 8 meters away, especially if I am ahead now, he goes for those two strides down and then leaps. Seems like if he would just follow through with half a stride he would be fine, but he isn’t doing that right now. I’ll have to review my old videos, but it is almost appearing that he doesn’t think front feet hits are OK? As that would be the next hit when he doesn’t adjust and tries those two strides -- just a half stride more would be front feet in? Yes, go back to his good set up and then either go very gradually OR, another idea would be ping pong-ing between the two: few repetitions like that, then pull the tunnel some more, then pull it back closer etc. My dogs do best with challenges when I throw them in here and there only -- too much focusing on something they find difficult often affects their confidence and makes them hit high. On another note, Silvia, Thrill has messed up his dew claws; they are very sore, and I’m planning to not run/train much, until they grow out/heal.. BAD timing, but I don’t want him lame!! Not sure yet when he can be back to work… Too bad with all this lovely weather finally too..
Why do you think a blind before would make him miss the contact? I never noticed the correlation, but whenever possible, I like to do the blind after A-frame as it gives me extra nice hits 🙂 Sorry to hear about the dew claws… Did you try bandage, would that help? Hahaha, YES, in retrospect I think a blind after would have been a better choice on that section. I often do blinds after as I can get there. 😀 But, he still should get his contact no matter that I am so far ahead or his approach wasn’t great. Do you have any advice for inept ball throwers?? I have video of our first full dogwalk training session that I will try to edit tonight. I tried it at the lowest the legs would go first just to see but I am pretty sure I am going to have to drop it lower to get him sucessful. so I’ll have to hit the hardware store again for more cinder blocks!! Well, some are using ball throwers (chunk-it? ), it seems to work really well! And yes, tossing early and far enough is very important at first, that’s normal. Looking forward to see how he is doing on a DW! Well here is my video of first time on low dogwalk. At this time I went as low as legs could go…just to see since taking it off legs will mean some additional set up work. I will say there are a LOT of misses! LOL! but good news is that from the video I think I am starting to see the piece that Nevis is struggling with. Please let me know if you think my analysis is off the mark. As you had thought…Nevis wants 4 strides. This of course means Nevis needs to stride that last apex reaching with his hind feet. Nevis is such a thinker and I believe at this point in time he just hasn’t seen any proof that this type of striding pattern is possible. The last few runs on the video I thought he was getting tired but now I wonder if he was just trying to figure out that last apex thing! I am guessing that by dropping the dogwalk lower the apex will be less obvious and he might feel more comfortable with the idea of coming over it with hind feet. So that is where I was headed next unless you have any other suggestions. Yeah, his problem seem to be that he is between 4 and 5 strides… He will need to be able to adjust and do either 4, 4 and a half or 5 I think… For now, we need to help him to get in. 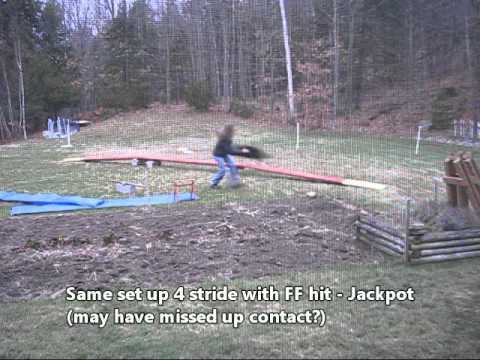 I’m not sure if we can constantly get 4 strides hit by lowering it… But we can try. Some partial DW work would be good too to show him the importance of getting all the way down. Just as an update…no video as I’m still in hypothesis testing mode! I started to think of why Nevis always ran so well at Anne’s and I think the biggest difference besides equipment is the run out area. I have good sized back yard but living on hill makes one side sloping away, one side sloping up and trees and house boxing in the rest. I forget how little it takes to make Nevis feel “pressure” so I have done some redirecting of dog walk to give more space and this mornings session was WAY better! I was actually able to find a spot where he was always in so I have a place I can fall back on if he has too many misses which I haven’t had for the past week! After some more sessions I’ll see how the trend is and let you know. What a journey Nevis and I are having!! Sure, that could be a reason! Glad that moving the DW helped and you have found a good spot, that’s a really important thing to know! Looking forward to see the video! It is a small step but a very happy step!!! I made sure to start session with a couple flat wide plank on ground to remind him the feel of running. Then I played with his good spot and some not so good spots where we did have several misses. That’s when I went back to good spot a couple time and one additional run on flat wide plank. When I could see he was excited by game I sent him to a pole wrap and took off running and he did too 🙂 I had to try it again while he was so happy and it was another Jackpot! Now when frustration creeps in I will try to remember these two dogwalks and remind myself how beautiful it WILL BE!! Yeap, those good ones are a kind of addictive 🙂 I’m sure you’ll be seeing more&more of those, sounds like you’re on the right track now! Finally was able to have help taking video (thanks Anne). So we had some misses and we had some beautiful hits. At this point I think I will keep working at this height till he gets more consistant/comfortable. Should I still also be trying to start him at various points on the plank or should I just stick with full length dogwalks at this point? Wow, beautiful ones are sure beautiful! Try to find a pattern in what gives you those nicest hits and then try to get as many of them as possible. Try to avoid situations that give you 3 strides tries and situations that give you too short 4 strides (late throw?) for now. You can of course do some partial DWs too, trying to find a good spot first and then challenging him some. So I just had a session where ALL full DWs were short strided 4 strides. (you know those situatioins you told me avoid 😉 !) Nevis will not put down that 1/2 stride he needs. Granted this is just one session. Still getting nice hits from top of ramp and I got one from top of upramp. He was even launching himself from just above 1/2 way down the downramp. What can I try to make it an appealing option for another stride? I did try a couple tighter entries to decrease his speed but that is when he started leaping from even higher :-0. In one try he should have been able to put a full fifth stride. Would raising the DW be of help or hinderance in this type of situation? If you’re getting real leaping now, it means raising would be contra-productive. We were probably pushing for too much too soon, we need better understanding of the running part first. Start him at his good spot for now and then slowly move him further back. Thanks will try to take some of the pressure off him and stick with those top plank starts for a few sessions again. These 180 degree shifts are making my head spin! The session before this most recent one was up in the 80% range with nice rear hits…ah well. Some days are better than others. Will try again tomorrow. Well, if it’s just one bad session, then I wouldn’t worry about it. But if you get more in a row, then you definitely need to do something to help him get on the right track again. Here is a bit more video. Sometimes I think he is getting and then I feel like he has no clue! This video is all from last Wednesday when we were able to do an AM and PM session. One thing that I have been wondering about is the increased occurance of Nevis loosing separation on downramp. After the last video above I did numerous session with Nevis from near or at the top plank and I am wondering if during that time while I was rewarding hits I was also rewarding closer feet since he usually does not get as much separation at that close of a range to contact. I am a bit concerned where I should go next. Should I just continue with tunnel to DW set up and hope that if I stop rewarding close feet it will start to fade? I have gone back to plank on ground and he give me beautiful separation there. Well here is video…hope I’m not straying too far off track! Nevis is sure keeping us challenged 🙂 The problem is there is no pattern, he has some beautiful hits and some big leaps, both being quite unpredictable and not-reproducible… Now, if he is still running a plank nicely, you could take an advantage of the hilly area that you have, put a plank on a slope, then add the second plank, supporting an apex with some bricks (see Bill’s videos) and finally the third, building the DW over the top of a hill (see Ania’s early videos). I think that would allow us higher successful rate and actually get us to the goal faster, but then, I’m not sure if the weather will cooperate? Funny you mention the not consistent part because that is what is totally making me pull my hair out! Unfortunately my hill begins where my woods end so I wouldn’t be able to get that kind of set up. But I will look around and see if I can get creative. You know I’ll keep you posted! Next question…tried session with DW that would did not drop as far as my home one. Didn’t go that well so I think I only had 3 jackpots out of 10. I will for now only work on DW’s that I can lower further. So I have another question about the hill set up. Does the hill have to flatten out at the end? 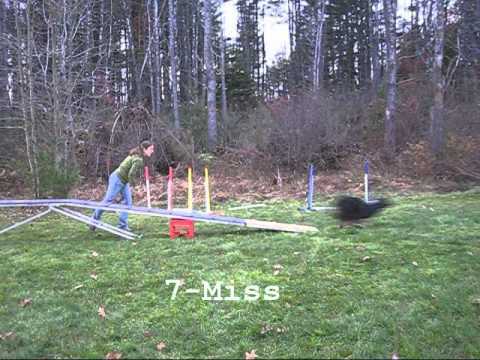 I have a fairly flat spot that drops away but keeps dropping away past what the length of the dog ramp would be. Is that ok? Sure, no problem if the hill keeps dropping -- it’s hard to make the hills stop from dropping at the exactly the right spot 🙂 And yes, raise the height gradually, no big changes in height. Is he still running well on yours? I am hoping it will air out today and I can try tonight or tomorrow morning if I get it covered again. If he is still running ok on mine do I just stick with that, SLOWLY raising it or should I try the hill either way? Will definately try the hill if he flounders in the next couple tries on 8 inch DW. If you have an extra plank, you can do both, start with some plank work, then go to the DW and then return to the plank if you get too many bad ones in a row. 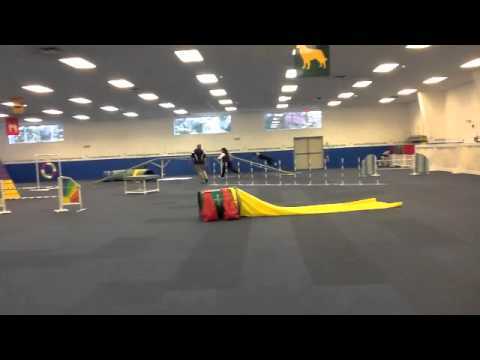 I starting thinking about inconsistency and two places have been very inconsistent in my training with Nevis…starting location (trying to get that sweet spot) and my darn ball tossing. Could be that when we were thinking we were rushing Nevis on DW height it was actually me rushing him away from ball chasing with earlier throws before comprehension? Jury is still out until I do a few more sessions. I did another session video attached 🙂 It wasn’t many runs but they were all really good efforts with earlier ball toss. Hopefully this will start good trend. My other thing is a question about the hill set up. Can you explain to me why this type of set up works better for some dogs rather than full DW? What type of situation are we trying to create (beside a successful situation!) or should I ask why does it make dogs more successful? Hm, yes, maybe the pattern is that he won’t put the fifth stride in. And then if he is fully extended, he is in with 4 strides and if he is too high with 4 strides, he just leaps off instead of trying to fit the 5th one in. In any case, the good news is that if you can get consistent hits now by throwing the toy late, that’s a very good start and I would keep doing it for a while to get more good hits, before starting to add challenges. The reason why hill is good is to make a transition from a flat plank to DW smoother: so instead of taking a dog to a DW directly from a flat plank, you introduce a plank at the angle of the hill, so it still looks the same as running on a flat plank. Then you dress up the hill in 2/3 of a DW, still looking very much like a flat plank as it’s just a “dressed-up-hill” and when you build a whole DW on it, it looks like a really low DW despite there is already quite some angle. In short, the transitions are softer, every new step looks very much like the one before, there is no big step from just a plank to a real low DW. I have written this numberous times now and keep erasing because it is confusing what I say! So I try short and sweet this time…Have you ever had a dog that could only do a couple of reps at a time during this running DW training? Nevis often is now giving me a couple good hits up front in session and then performance decreases. 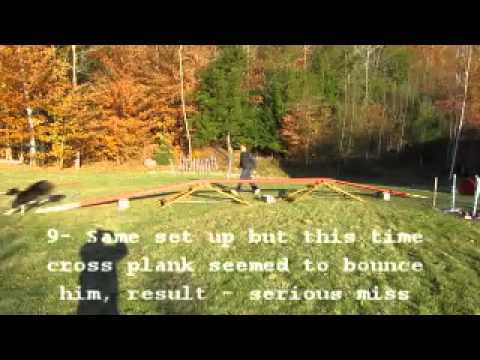 Last session I even went back to flat plank on ground, 1 time was perfect jackpot…we played and had fun. Went to do it again and immediately he started missing and after 4 more misses I just stopped. Maybe now that training sessions are more limited I am trying to get too much in to one session? He has never been a dog that has thrived on repetition but I thought the toy playing would help with that. I have a few videos from the taller DW session and some from this morning on 6 inch 2/3 DW that I will try and put together for you to see before the end of the week. It would be good if you video and post it. It could be he gets tired and his strides get shorter or that he gets extra excited after the jackpots and skips the last stride… It would be good to see exactly what goes wrong with his striding to know how to handle it. I started doing just the end part but she wasn’t comfortable with it and was praying me to run the whole thing. I tried and it worked much better (she loves this new game!). As you can notice I wasn’t strict with my criterias on purpose to give her confidence. Hope you think we can keep up practicing. PS: I loved your article on Bu; You are a really nice person and I am happy to have met (on the net for now!) you. Yeap, that’s pretty high, so not ideal as that’s not her full speed… But maybe she just needs some time… How many sessions did you do by now? How do you reward? Where does she start? Make sure you give her a fast, straight approach and throw a toy in advance for now, we need the speed first. She starts from a cap around a cone (so without speed neither distance). I was afraid she could fell down because generally speaking, she still has a “puppy attitude” with her long legs ! But if you want I can position on like 4 meters straight before. She has worked on it twice :saturday and yesterday. I rewarded the 1st session with a toy thrown in advance and I tried changing for the 2nd session with a toy on the floor, she was less leapy but somewhat slower. I think she felt more comfortable with the toy on floor because she can 1st concentrate her on the DW and then grab the toy (she isn’t really driven by thrown ball anyway). This week, I can go tonight, thursday, friday and saturday. How do you advice me to proceed? Yes, try straight forward approach and focus on getting speed first as practising at less that full speed doesn’t really give you a realistic picture. It’s what I’ve tried yesterday evening… And what I feared occurred: she felt down. Since she was leaping all the time, everything felt into pieces. 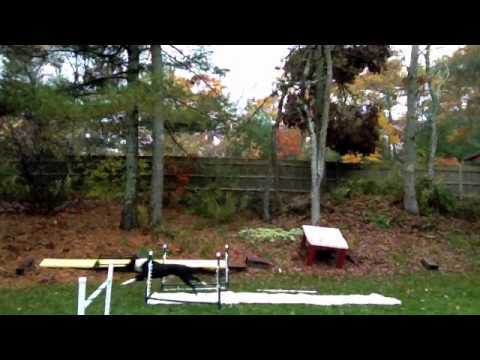 So I plan to train at home on the knee-high-plank to get her back to a nice hind feet separation and go back to the club tomorrow and tape a video a Saturday to show you how she goes after 3 more sessions on it. Would you have a more appropriate strategy? Yeah, lower, safer set up would definitely be best… If there is no such option, you can work with less speed for now: won’t help with her contacts, but will help with her coordination and confidence on a DW, so maybe that’s what she needs first… Meantime, you could do some contact work with a plank, bring it outside sometimes to at least work on a plank with full speed. at least you agree I can keep on practicing RC instead of changing for 2on2off! If everything work as I’ve planned I’ll be sending you a video this we. PS: we worked at home yesterday evening and her hind feet separation was still there. Everything hasn’t felt down completely! I’m still somewhat worried it might fall apart when she is to full speed… So do try to do some plank work with full speed, outside too! La plupart des clubs autour du mien ont des zones smart mais mon club a acheté des zones d’une autre marque. Nous les aurons fin janvier. Donc dans le prochain cours je pourrai m’entraîner sur des passerelles différentes. 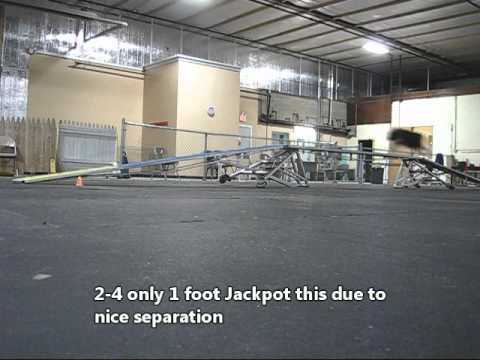 22″ low dog walk, no hits when running full dw. Tried 2/3 dw at same height no hits. oy, so sad. Yeah, I think we need to go back down, probably all the way to the carpet and work on his running first: he is not running equally here, so it’s hard to help him… We would need nice, full extension running first -- first on carpet, then maybe two planks end to end on the floor and then raising them slowly. If he keeps running normally, we should be able to raise it fast then, but for now, he doesn’t know it’s about the running yet. So I would really focus on that part first. Better, he is running more equally now. First and last are somewhat leapy, the rest is o.k. Do at least 5 sessions more on a carpet, then try flat planks. She barks when I am on her right. I think that I have mostly been on her left. This video is half speed instead of quarter speed since I show her doing the full dogwalk and so many tries. I have been able to schedule another rental for this weekend. My plan was to try again and see if could get more consistency and speed. I tried sending her through a tunnel a couple of times and got jumps (some of the jumps in the above video). I am hoping to be able to get in at least two rental times per week. I don’t know if she is ready to do an A-frame as she has only been on the half height dogwalk a few times. Sorry -- here is the link to the quarter speed video for anyone who has some extra time 😉 or wants to watch it in slower motion. The problem seem to be that she she comes with too much speed, she flies the apex too much to add the fifth stride -- and when coming with not enough speed, her forward focus is gone and then she is turning into you, barking and shortening too much to be in. To avoid both, I would avoid completely the straight approaches for now, but would try sending her on from other approaches (rather than recalling from a stay) + would move more to help her focus ahead and still run with good speed -- you will never be that static on a real course anyway, so you can make it more real already now. If that helps, I would raise it some more and introduce straighter approaches with every next height -- about what we’re doing with Maureen and Spec. Also, tries like 10 deserve a decent reward, that was a very clear in the middle hit, even if with just one foot. Anyway, she seems to be between 4 and 5 strides: when she is running well (vs. looking back at you), 5 strides put her in with front feet and if she runs even more, she goes for 4 and misses. 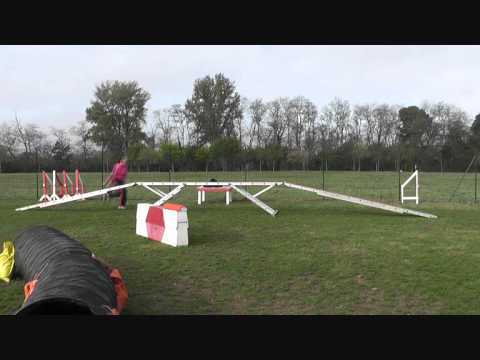 We need to make DW higher and approaches difficult to make 4 strides less tempting and easier for her to fit 5 strides in. If you want to try A-frame too, you can do that too as she is running really well now, no air, she just needs to sort out the striding. Thank you very much for your comments and advice. I was able to practice once this week. I left the dogwalk at the same height. I placed a toy again after a jump. I added a jump on a curve so that she did not have a straight approach and I ran with her as you suggested. She was faster. I did two sessions. The first session I did 9 tries and she was rewarded for all of them (some jackpots). 5 were two front feet hits, 1 was a front foot and back foot, 2 were one front foot and two back feet, one was a high 2 back feet. The second session had quite a bit of jumping and barking at me (9/13). She did manage to get 3 in that I could reward (I also think that I rewarded the one where I started her in the middle). I thought that she might have been getting tired and/or silly but I think that for some of them I was perhaps too far ahead of her. 12 is interesting as she seems to really shorten her stride to get in the yellow. 22 looks like her back feet are together as I can’t see her other leg. Here is the half speed video (I didn’t put in comments for most of the non reward ones). I am hoping to get in two sessions this weekend. The first session was sure great and yes, the major problem with the second session is that she is looking back at you… You could try another, more interesting toy after the jump OR a tunnel instead of a jump if she likes that better OR you could try setting a toy there, but then also throwing a second toy for her as she takes the jump/tunnel -- with Le, the anticipation of a toy flying over the jump gave me much better forward focus and speed as leaving a static toy after the jump. If you can get two or three sessions like a first one, you can raise it some again.